Supplements have become popular over the last few years, and there are a host of different ones health experts recommend to help with a variety of ailments. 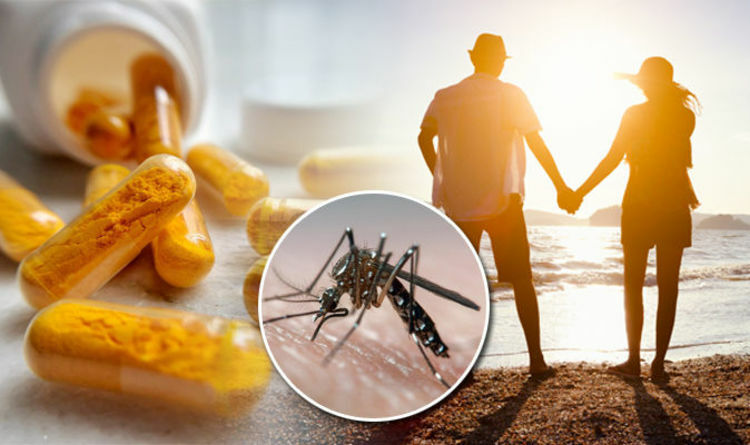 A common problem people have to content with on holiday in locations all over the globe is mosquito bites. But Dr Andrew Thornber, chief medical officer at Now Patient, says taking vitamin B12 before you travel can help prevent them. Vitamin B12 is a nutrient that helps keep the body’s nerve and blood cells healthy and helps make DNA. Dr Thornber said this is worth taking a few weeks before you travel overseas. Dr Thornber goes on to list other health recommendations to think about before you go away on your holiday. When choosing sunscreen, the label should have the letters “UVA” in a circular logo on it. On long-haul flights, get up from your seat to walk around and stretch your legs whenever you can. Make sure your vaccinations are up to date and check if you require any new ones before you travel, especially outside of the EU, advises Dr Thornber. Another health problem travellers may want to consider is DVT. DVT, which stands for deep vein thrombosis, is a condition caused when you’re inactive and blood collects in the lower parts of the body, often the lower legs. Examples where this can happen include long journeys, such as flying on a plane, or after an operation. As a result a person may experience pain and swelling in their leg, and it may lead to complications such as pulmonary embolism. Pulmonary embolism is a blockage in a blood vessel in the lungs, and this can cause shortness of breath and chest pain. In severe cases this can be fatal. So what signs and symptoms should you look for to indicate you have DVT?